England Women's World Cup winners Sophie Hemming and Rebecca Essex have retired from international rugby. The pair helped England win the World Cup for the first time in 20 years with a 21-9 victory over Canada in August. Hemming, 34, who earned 71 caps at prop, said she felt the time was right to let the next generation to take the side forward for the 2017 World Cup. Essex, 31, a second row and full-time teacher, said the summer's win was "the best way to end my career". 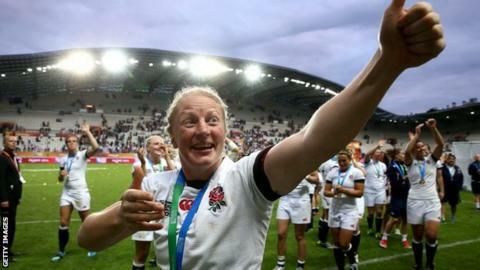 England head coach Gary Street paid tribute to the pair, saying: "Sophie epitomises hard work. During her rugby career she transformed herself into one of the most talented props in the world while remarkably balancing a demanding career as a vet. "Becky is another one of our incredible generation of players who have balanced demanding jobs with playing international rugby. " It means five of England's World Cup winners have announced their international retirement, after flanker Margaret Alphonsi, second row Joanna McGilchrist and wing Katherine Merchant all ended their careers with England in September.